Could not find default endpoint element that references contract 'IMySOAPWebService' in the ServiceModel client configuration section. This might be because no configuaration file was found for your application or because no endpoint element matching this contract could be found in the client element. I'm running XP local (I mention this because a number of Google hits mention win2k3) The app.config is copied to app.exe.config, so that is also not the problem. "This error can arise if you are calling the service in a class library and calling the class library from another project." In this case you will need to include the WS configuration settings into the main projects app.config if its a winapp or web.config if its a web app. This is the way to go even with PRISM and WPF/Silverlight. I solved this (I think as others may have suggested) by creating the binding and endpoint address instances myself - because I did not want to add new settings to the config files (this is a replacement for some existing library code which is used widely, and previously used an older Web Service Reference etc. ), and so I wanted to be able to drop this in without having add new config settings everywhere. If you are using https then you need to use BasicHttpsBinding rather than BasicHttpBinding. Now the Consumer project had all the related configuration setting in <system.serviceModel> Tag of my app.config, its was still throwing the same error as the above. All i did is added the same tag <system.serviceModel> to my main project's app.config file, and finally we were good to go. The Real problem, as far as in my case was, it was reading the wrong configuration file. Instead of consumer's app.config, it was referring main proj's config. it took me two hours to figure that out. "In this case you will need to include the WS configuration settings into the main projects app.config if its a winapp or web.config if its a web app. This is the way to go even with PRISM and WPF/Silverlight." Yes, but if you can't change main project (Orchard CMS for example), you can keep WCF service config in your project. See details in this article. This one drove me crazy. It turns out that its looking in the Shell's .xap file for a ServiceReferences.ClientConfig file, not in the module's ServiceReferences.ClientConfig file. I added my endpoint and binding to the existing ServiceReferences.ClientConfig file in my Silverlight Shell application (it calls it's own WCF services). Then I had to rebuild the Shell app to generate the new .xap file for my Web project's ClientBin folder. Several responses here hit upon the correct solution when you're facing the mind-numbingly obscure error of referencing the service from a class file: copy service config info into your app.config web.config of your console or windows app. None of those answers seem to show you what to copy though. Let's try and correct that. Here's what I copied out of my class library's config file, into my console app's config file, in order to get around this crazy error for a service I write called "TranslationServiceOutbound". I was getting this error within an ASP.NET application where the WCF service had been added to a class library which is being added to the ASP.NET application as a referenced .dll file in the bin folder. To resolve the error, the config settings in the app.config file within the class library referencing the WCF service needed to be copied into the web.config settings for the ASP.NET site/app. 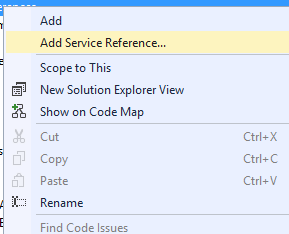 I found (as well as copying to the client UI's App.config as I was using a Class Library interface) I had to prefix the name of the binding with the name of the Service Reference (mine is ServiceReference in the below). I had the same problem, but changing the contract namespace didn't work for me. So I tried a .Net 2 style web reference instead of a .Net 3.5 service reference. That worked. To use a Web reference in Visual Studio 2008, click on 'Add Service Reference', then click 'Advanced' when the dialog box appears. In that you will find an option that will let you use a Web reference instead of a Service reference. Unit testing a non-library application that consumes a service can cause this problem. The information that others have entered addresses the root cause of this. If you are trying to write automated test cases and the unit you are testing will actually invoke the service interface, you need to add the service reference to the test project. This is a flavor of the application using library type of error. I did not immediately realize this though because my code that consumes the interface is not in a library. However, when the test actually runs it will be running from the test assembly, not the assembly under test. Adding a service reference to the unit test project resolved my issue. I have a situation which in the Unit test. I copied the app.config file to the unit test project. So the unit test project also contains endpoint information. I faced this problem once. It was because i was still developing the interface that uses WCF service. I configured test application and continued development. Then in development, i changed some of the services' namespaces. So i double checked "system.serviceModel -> client -> endpoint -> contract" in web.config to match WCF class. Then problem is solved. 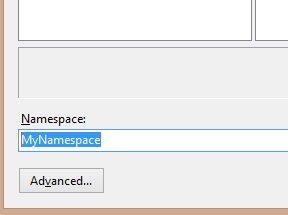 The namespace in your config should reflect the rest of the namespace path after your client's default namespace (as configured in the project properties). Based on your posted answer, my guess is that your client is configured to be in the "Fusion.DataExchange.Workflows" namespace. If you moved the client code to another namespace you would need to update the config to match the remaining namespace path. Just for anyone else with the same problem; I wrote a unit test for my method that tried to connect to my service. It failed with this same exception every time - I have no idea why. When I ran it from a winform it works fine. I Have a same Problem.I'm Used the WCF Service in class library and calling the class library from windows Application project.but I'm Forget Change <system.serviceModel> In Config File of windows application Project same the <system.serviceModel> of Class Library's app.Config file. solution: change Configuration of outer project same the class library's wcf configuration. Hi I've encountered the same problem but the best solution is to let the .NET to configure your client side configuration. What I discover is this when I add a service reference with a query string of http:/namespace/service.svc?wsdl=wsdl0 it does NOT create a configuration endpoints at the client side. But when I remove the ?wsdl-wsdl0 and only use the url http:/namespace/service.svc, it create the endpoint configuration at the client configuration file. for short remoe the " ?WSDL=WSDL0" . Do not put service client declaration line as class field, instead of this, create instance at each method that used in. So problem will be fixed. If you create service client instance as class field, then design time error occurs ! This error can arise if you are calling the service in a class library and calling the class library from another project. There seem to be several ways to create/fix this issue. For me, the CRM product I am using was written in native code and is able to call my .NET dll, but I run into the configuration information needing to be at/above the main application. For me, the CRM application isn't .NET, so I ended up having to put it in my machine.config file (not where I want it). In addition, since my company uses Websense I had a hard time even adding the Service Reference due to a 407 Proxy Authentication Required issue, that to required a modification to the machine.cong. To get the WCF Service Reference to work I had to copy the information from the app.config of my DLL to the main application config (but for me that was machine.config). And I also had to copy the endpoint information to that same file. Once I did that it starting working for me. I have had both the configurations of the service model of WS1, and WS2 in the Console.EXE.config as recommended. - didnt solve the issue. But it still didn't work, until i have added the WebReference of WS2 to WS1 also and not only to the DLL that actually creating and invoking the proxy of WS2. As L.R. correctly points out, this needs to be defined in the right places. For me, that meant one in my Unit Test project's app.config as well as one in the main service project's web.config. I had this error when I was referencing the Contract in the configuration file element without the global scope operator. gives the "Could not find default endpoint element that references contract" error. The assembly containing MyNamepsace.IMyContract is in a different assembly to the main application, so this may explain the need to use the global scope resolution. Not the answer you're looking for? Browse other questions tagged wcf .net-3.5 wcf-binding endpoint or ask your own question. how do I make my application read the application config instead of machine.config? How can I unit test my WCF client class?